Through out the month of February, I have been sharing my experiences learning about spinning textured yarns with you here on the blog. 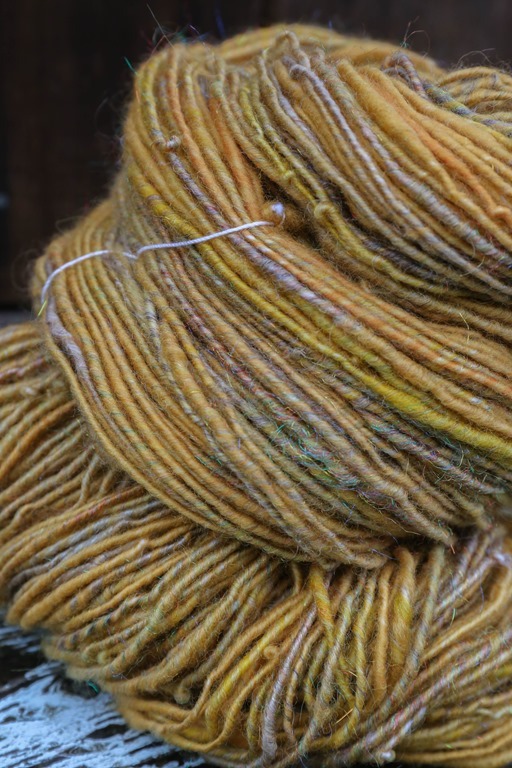 We started with a wee experiment and a Craftsy class, we moved onto a slightly larger skein in a 2 ounce batt from deep stash, then we explored thick and thin. Well, we are back to core-spun. Again. And I’ve learned some things. When I make core-spun yarn, it is more comfortable for me to wrap the fibre around the core when the wheel is spinning S twist (counter clockwise or to the left). I think this is because the core that I used was plied in S twist and so continuing to add ply twist makes a higher twist yarn. 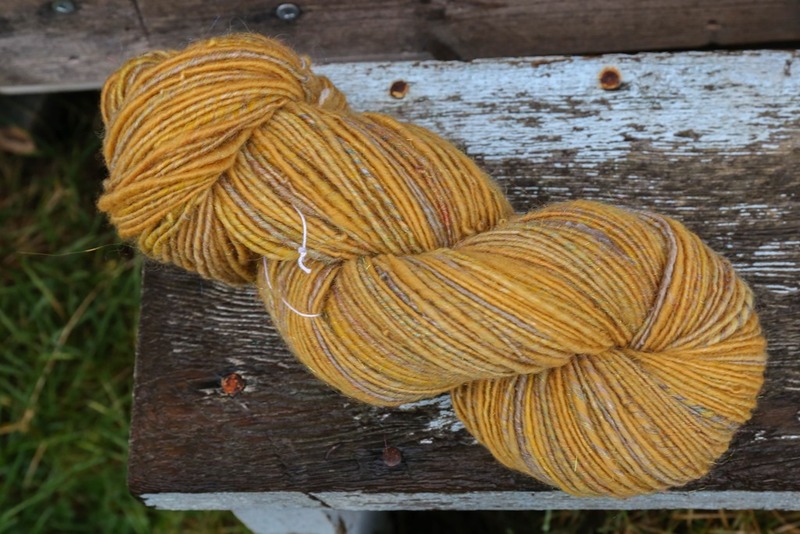 When I was experimenting with Z twist for my core, I was effectively unspinning the yarn. I think that is inherently why I had trouble wrapping the fibre around and achieving an even yarn. Moving my feet unbelievably slow controls the twist, gives me ample time to place my hands, core and fibre exactly where I need them without worrying about a significant amount of twist building up. This was compounded by staying on a large pulley or whorl ratio (5:1) and using my Jumbo flyer, which has a large orifice. A large orifice, like those found on jumbo flyers, is helpful when thicker core-spun is making its way onto the bobbin – it won’t be caught in small guides and hooks! Finally, core-spinning is addictive. I feel like I have a compulsion now to spin it with absolutely no intention or idea of what to do with it (I’m not a weaver and at this juncture in my life, I’m refraining from learning even on a little frame loom, which I understand the basic principles of but am refusing to go there). I have also come to some conclusions about core-spinning in my little corner of the world. Firstly, it is incredibly intuitive. Even the hand placement and drafting of the fibre, after understanding the construction of the yarn, is intuitive. It makes sense. 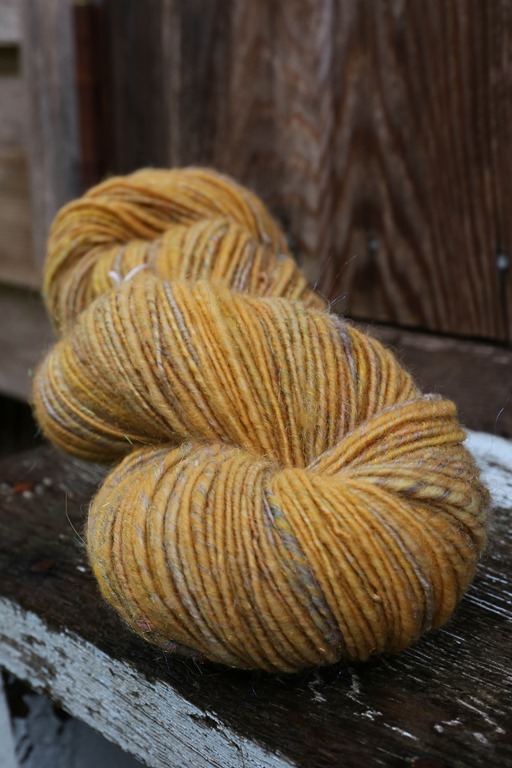 I really appreciate that about handspun yarn when the making of it makes sense. I think that’s why some of the yarns that are quite complicated, like adding beads, beehives and coils, etc., don’t appeal to me particularly. I enjoy just making simple yarn. 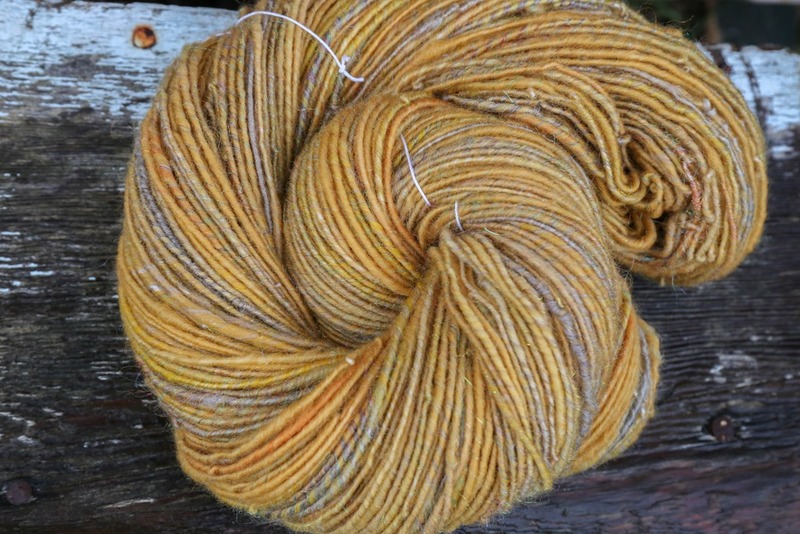 Well-blended batts off the drum carder seem to be key to core-spun. In this case, there are sections wrapped with 100% firestar and lacking any wool. 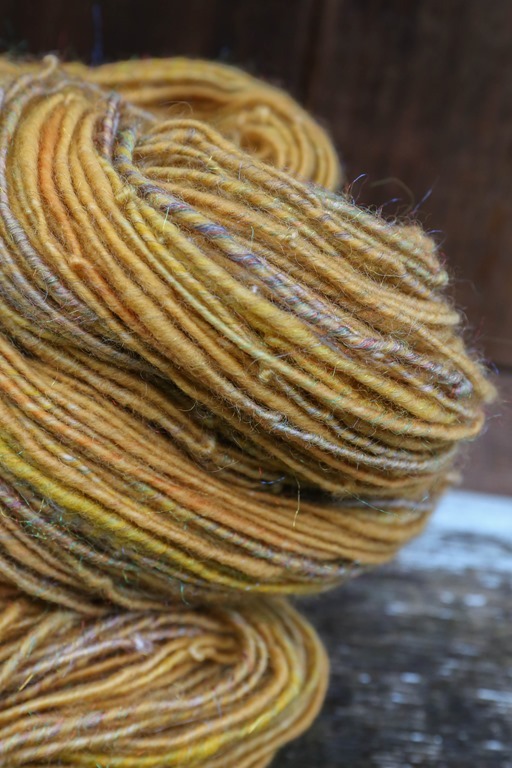 Lastly, where the batts were not well prepared (I made this batt when I first bought and received my drum carder) and the firestar, as well as the silk, was not well blended, the fibre that I was wrapping was sometimes just firestar. It was completely lacking any wool content! I’m not sure how strong this will be to wear and tear* or if this makes a difference to the overall integrity of the yarn. 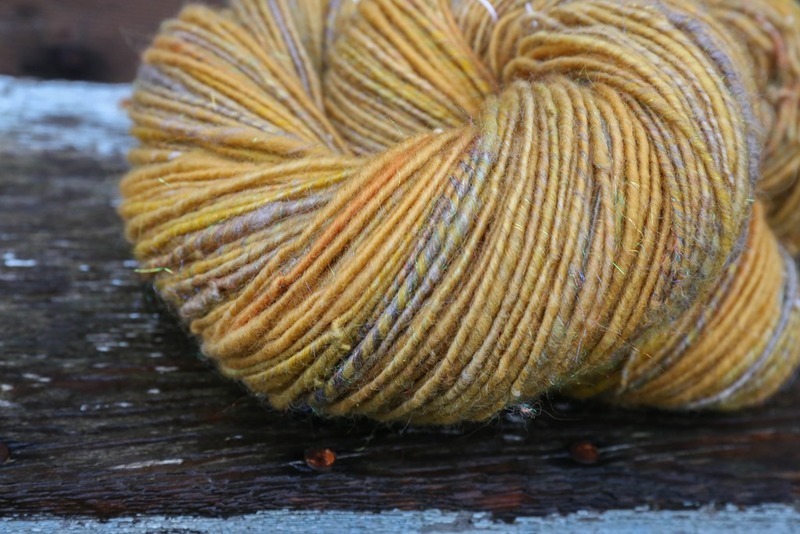 I hazard a guess that it does not but I would have liked some of that fibre to be more blended. 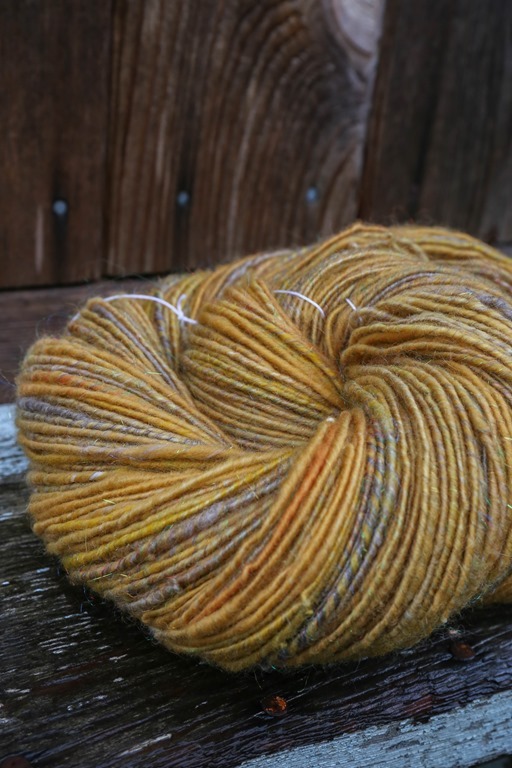 Will I continue to spin core-spun yarns? Definitely. And I plan to continue updating you on my slow progress into the world of textured yarns.